Cutthroat trout (Oncorhynchus clarki) have long been a staple of the sport fishing community, especially among fly fishers. These trout are found throughout the Pacific regions of North America, and in fact there are over a dozen sub-species known to have existed during the twentieth century. Unfortunately, several of these species are now extinct (including the largest) due to over fishing and development. While widespread, cutthroats appear to be very sensitive to over harvesting, a concern in states and provinces where they remain. Like other species of trout, cutthroats are a part of the salmon family (Salmonidae). They can be distinguished from rainbow trout because of their lack of an iridescent ribbon down their side. They tend to be smaller than steelheads, and cutthroats also have very small teeth towards the back of their mouths which steelhead trout lack. 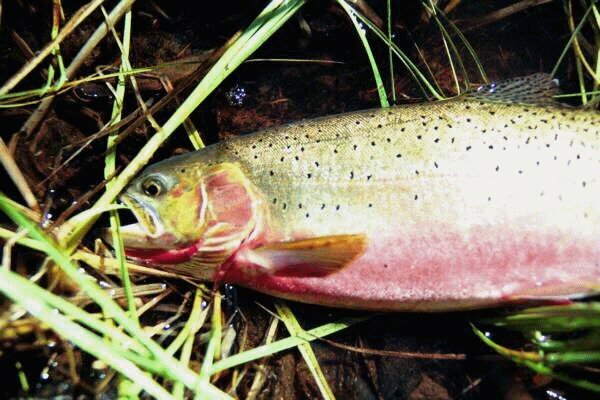 The size a cutthroat can reach depends on the environment it lives in. Small cutthroats are ambush predators; they will wait under lily pads or within patches of weeds and then dart out to catch insects or small fish that appear. As they grow larger, they also grow bolder. Cutthroats over 14 inches long are known as cruisers, because they begin to patrol their habitats in search of food, particularly other fish, although they will certainly rise to capture insects. 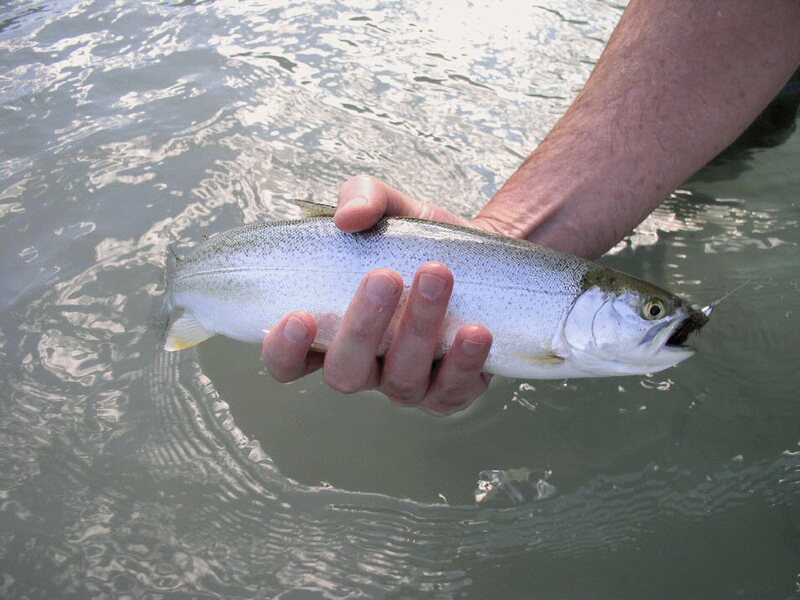 This type of eating habit leads to trophy cutthroats; these fish can grow to 28 inches. They may also weigh around eight pounds, and naturally will live longer than other members of their species; up to eight years. Cutthroat trout also have various ocean-going populations along the Pacific. These fish generally do not leave their freshwater streams and rivers until they are around four years, and head off to the ocean when they are about four inches long (usually in May in Alaska, and earlier the more south one goes along the coast). Cutthroat trout do not stay in the ocean for very long; they tend to make their way back to their hatching area after about one hundred days. While at sea, they do not take many risks; they never cross open water and stay within forty miles of the stream in which they reared. After spawning, some cutthroat will return to the ocean, but the rate is under 40 percent. The aggressive feeding behavior of the cutthroat makes it a great fish for anglers.  It will bite on almost any lure, bait, fly, or spinner that is small enough. 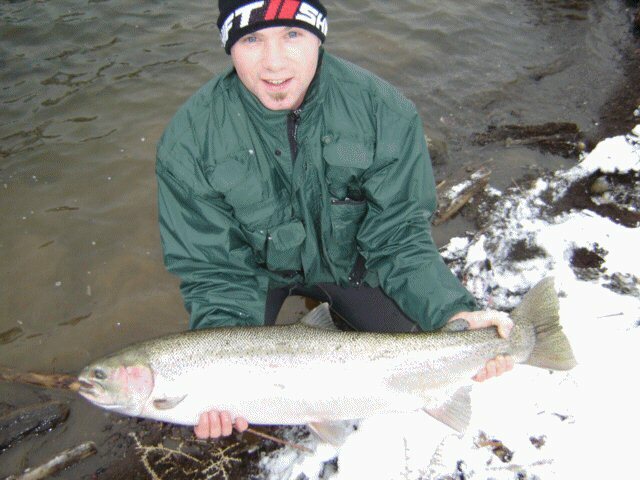 Trophy trout are often taken while fishing for kokanee or steelhead trout, species whose habitat and food sources they share. Because of the slow reproductive rate of cutthroat trout, wildlife officials in many state are concerned over their long term survival. Smolts are often confused with other species of fish due to their size, and as a result many cutthroats are harvest illegally (albeit unintentionally) each year. Population in hard-to-access areas do well, but there is concerns about the survival of the species when remote areas become accessible. 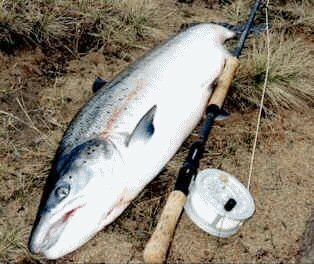 If you would like to learn more about each species such as Huchen Salmon, click on the hypertext or go to the top of the page to find out more about the species you're interested in.